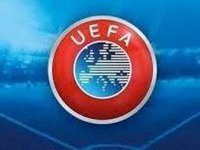 The UEFA Control, Ethics and Disciplinary Body (CEDB) has fined the Football Federation of Ukraine (FFU) EUR 35,000 due to the behavior of fans after the Nations League match between the Czech Republic and Ukraine, which took place in the Czech Republic on September 6, 2018, the FFU's press service has said. These funds must be paid to the specified account within 90 days from the date of publication of the decision. The FFU must also contact the Czech side within 30 days to determine the amount of further compensation for the losses incurred. As reported, after the Nations League match between the Czech Republic and Ukraine (1-2) on September 6, eight Ukrainian fans were detained for invading the field, rejoicing at the victory of their team. After negotiations, including with the participation of the FFU leadership, they were released and helped to pay the fine.